Tigger 2, our luxury boat charter company, provides visitors to the V&A Waterfront with a range of popular ocean-cruise options. We’re based in and have our flagship cruise boat moored at the V&A Waterfront. The waterfront is one of Cape Town’s trendiest destinations, featuring umpteen attractions for locals and tourists alike. Whilst we really are on the waterfront, our business is completely unlike that of another famous (or infamous) “on the Waterfront” – the multi-award winning movie that is said to have launched Marlon Brando’s acting career into the stratosphere upon the film’s release in 1954. The film won eight Oscars and was nominated for four additional Academy Awards. We cannot display Oscars, boast about attaining them or claim that achieving so many successful Oscar nominations is responsible for launching Tigger 2 Royale from her waterfront mooring. We have experienced cruise crew to launch our charter boat, a luxury catamaran. However, if there were such awards for Cape Town waterfront cruises, our luxury vessel, plus impeccable on-board services that make our Tigger 2 cruises so popular and admired, would surely have won our own series of Cruise Academy Awards. All our Tigger 2 charter cruises operate from our mooring in the exclusive V&A Waterfront, which is surrounded by wonderful, world-class attractions, destinations, and venues, while Table Mountain, Lion’s Head, and Signal Hill stand guard over the sheltered V&A Waterfront Marina, the harbour, and Table Bay. Tigger 2 Royale, with passengers aboard, sets off for the Atlantic Ocean waters just offshore from Clifton 4th beach or Granger Bay, where we drop anchor to allow our guests to immerse themselves in a totally different view of the shoreline and its breathtaking landscapes. Passengers gather on deck to enjoy the vistas with a glass of bubbly in hand. We depart again for the Waterfront, travelling at a leisurely pace to allow everyone aboard ample opportunity to absorb the sensational splendour of an African sunset from across the water. Actual cruise time for non-private charters is either one and a half or two hours, depending on which type of option is selected. 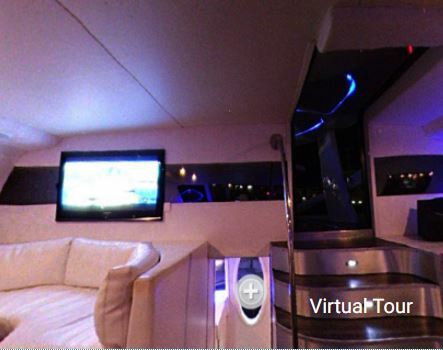 The cruise duration or time aboard are adjustable when booking private charters. An hourly charter rate applies. 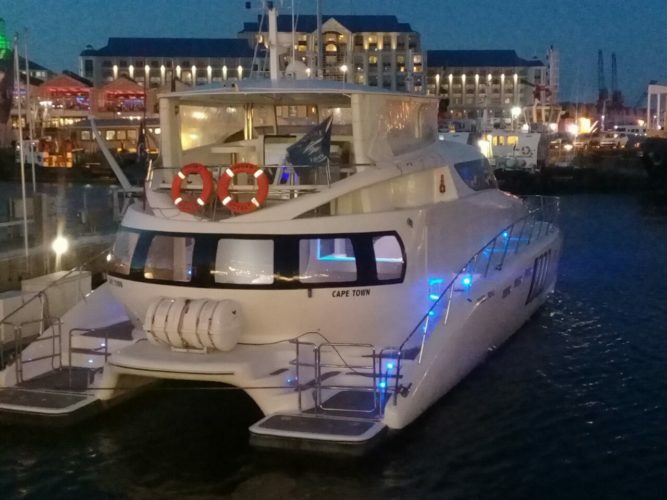 Should your cruise party wish to utilise Tigger 2 Royale as a floating venue, moored in the waterfront, or you prefer to cruise within the V&A Waterfront basin or the commercial harbour for one and a half hours, without venturing out to sea, we’ll happily accommodate you. Tigger 2 is at the waterfront awaiting your pleasure.